In some parts of the world, there are entire cities made of earth. It’s one of the oldest building techniques there is: Scoop up the mix of clay and sand and silt that lies beneath the topsoil, pack it into walls that capture heat and keep the house warm, that protect from the rain, wind and sun, and that can stand strong for hundreds of years. There’s more than one technique for turning earth into buildings — making adobe bricks and drying them in the sun, building cob houses of balls of clay and straw, stacked together and stomped into place. And while a range of these techniques have been used to build simple structures around the world, in the past few decades, one of them — rammed earth — has been modernized and used to create beautiful, sustainable buildings in Australia, Germany and Switzerland, and from the Southwestern U.S. up through California and the Pacific Northwest. The idea of rammed earth is simple. Essentially, it’s a type of masonry, like stoneworks or brick walls. Gather nearby dirt — it can even be from the site you’re building on — and build the wooden forms that will shape the earth into walls. Pour in a layer of dirt, and pack it down. Add another, and another, until the wall is built of multihued layers of earth. 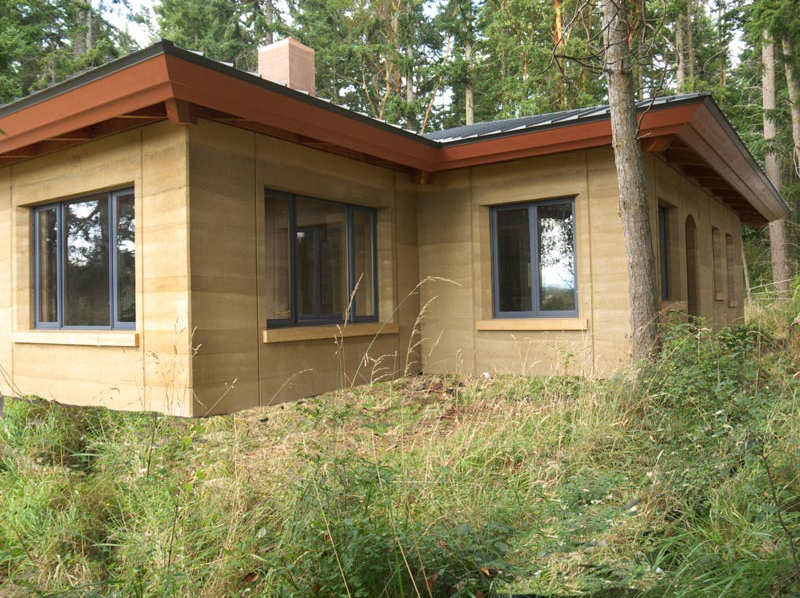 Depending on where you’re building, there are additional considerations: Colder climates require insulation, and rammed earth builders will carefully calibrate the mix of dirt to ensure its structural soundness. It’s a labor-intensive process — “not for the squeamish,” says Gryphon Construction’s Peter Jones — but builders who’ve fallen for the technique say it’s all worth it when you pull off the forms and see what you’ve created. Despite its beauty and its benefits — which include soundproofing, heat retention and a relatively low carbon impact — rammed earth has shown up in modern cities, when it shows up at all, on suburban edges, in places like university campuses that have space to experiment, or in special, feature walls of larger buildings. One of the technique’s main drawbacks, in dense, urban places, is that rammed earth walls are thick. They might be 18 inches or, in dramatic examples, four feet wide. “You’re going to get an architect who looks at the square footage on the property and says: I love those 18-inch-thick walls, but I can’t afford to lose the space,” says David Easton, the founder of Rammed Earth Works, who has been working on rammed earth buildings since the 1970s. 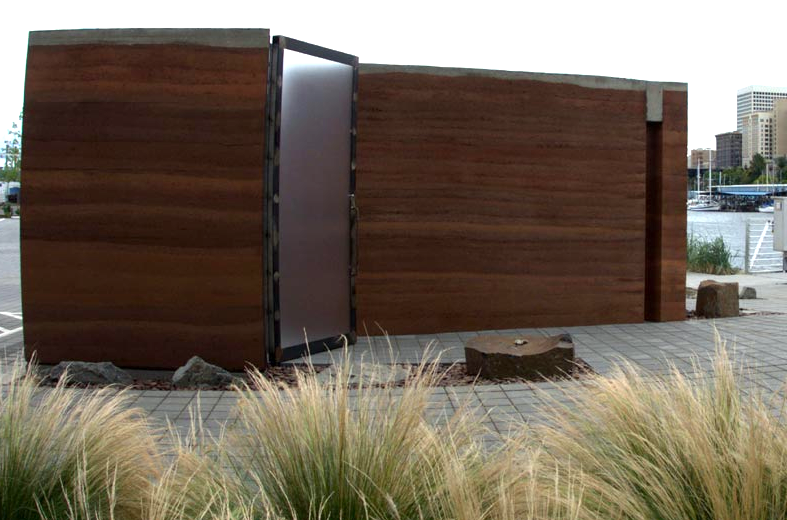 In the past few years, though, it’s become more common for designers to include rammed earth as feature walls in buildings — they’ll include one or two rammed earth walls for their look and feel and for their more practical properties. Jones worked on a project in Victoria, British Columbia, the First People’s House, where his team built a rammed earth wall on either end of the building, which gave it, he said, “a cathedral-like feel.” In one project Windstorm worked on, in Jordan Valley, outside of Salt Lake City, a rammed earth wall separated the main building from a greenhouse, from which the wall absorbs heat to pass into the building. Easton has been working on a project, though, that could change that — a rammed earth block that’s made of quartz, recycled concrete, locally sourced earth and other materials. The result, the Watershed Block, could be used just like concrete blocks are today. The technology was selected as a finalist in SXSW Eco’s pitch competition, which will culminate next week, in Austin. Concrete’s one of the most commonly used building materials on earth at this point, and it’s terrible for the environment. It requires large quantities of energy-intensive cement to hold it together. And while rammed earth builders also use small amounts of cement to add strength and solidity to their walls, it’s nowhere near the quantity needed to build a concrete wall. Concrete bricks, though, are convenient and versatile in a way that rammed earth is not. “We thought if we could take the beauty of earth and put it into a small format, a brick format, we could capture this market share that had been denied to us,” says Easton. In theory, this would mean that skyscrapers could be built out of blocks made of earth. But they’re more likely to be used in the day-to-day construction of rapidly growing cities. China’s building its infrastructure up so quickly that it has used more cement in just a handful of years than America did in all of the 20th century. Switch concrete out for rammed earth, and all of a sudden, you’ve made a noticeable impact on a city’s embodied carbon. If Easton and his colleagues are right about the potential of their technology, these blocks could be what makes rammed earth accessible as a building option in modern cities — and finally unlocks its potential as a local, low-impact building material.